Passes for the parties, workshops and competitions are sold à la carte this year. Pick and choose the activities you want to be involved in to create your perfect ESDC experience! Registration is now open. 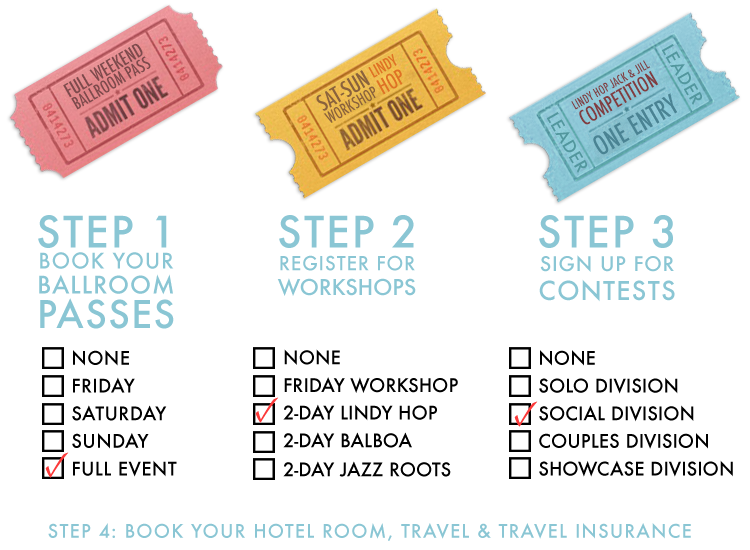 You will be able to buy passes and sign up for competitions at the event, but only if places are available. Certain items are expected to sell out. Ballroom Passes are your entry to the ballrooms to watch or compete in the contests, and to social dance all night long! Workshop Passes are your entry to classes with world renowned instructors. The contests are held in the ballrooms, so to compete in any contest you will need a valid Ballroom Pass for that day. Competition entry fees are extra. Many competitions and workshops will sell out, so register early to secure your place.